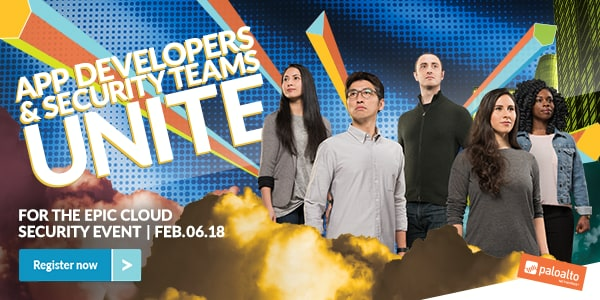 Blog Home > Events > Join Us February 6 for The Epic Cloud Security Event! Join Us February 6 for The Epic Cloud Security Event! How do you get alignment across IT to achieve the perfect balance of agility and protection? Join us on February 6, 2018 to learn firsthand from cloud pioneers and global organizations that dove into the cloud – and succeeded. Hear their real-world experiences in a candid, fast-paced and enlightening cloud conversation. Learn how to consistently protect your public, private, hybrid or multi-cloud environment without slowing down DevOps. Walk away with ideas you can leverage immediately. Register now to be part of this epic online cloud security event. Excited to learn about cloud security.